Wall Street banks prefer clients with millions -- if not billions -- to invest. Soldiers, nurses and construction workers typically aren't anywhere near that wealthy. That's why a growing number of average Joes are turning to an app called Stash instead. On Stash, you can start investing with just $5. The company's motto is "investing for real people." "Lots of our users start investing with less than $100. For us, that's great because they've taken that first step. They're learning," says Brandon Krieg, co-founder and CEO of Stash. Stash launched last fall. It already has over 150,000 users. About 10% of those are active-duty military, says Krieg. It's a high percentage considering less than half a percent of the U.S. population overall currently serves in the armed forces. "Stash is the solution for millions of Americans traditionally ignored or taken advantage of by big investing firms," says Krieg. "Almost all of our customers are first-time investors." The app helps steer you in the right direction, but you still get to make the final decision. That's different than the so-called "roboadvisor" apps like Wealthfront and Betterment, where a computer decides how to invest your money. "Financial literacy in this country is a huge problem," Krieg told CNNMoney. 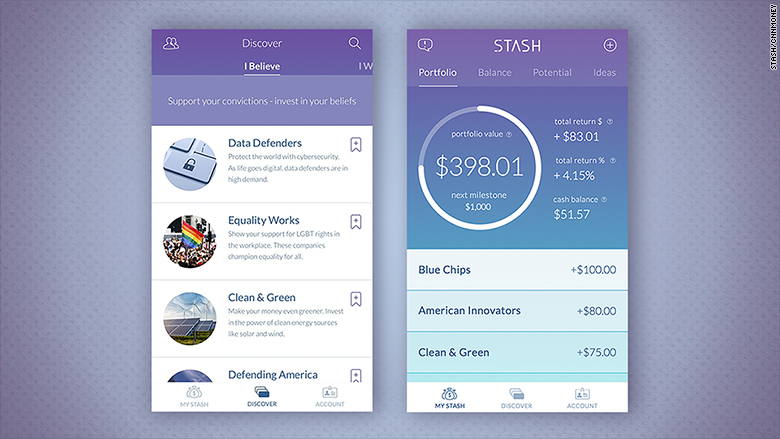 The Stash app is about to unveil a new feature called "learn" to help educate users even more. Stash encourages most people to put at least some of their money into the "Moderate Mix" fund. Think of it like vanilla ice cream: A very solid option that still satisfies a person's desire to grow their money for retirement or sending a kid to college. Users can also choose from other funds like "Internet Titans," "Defending America," and "Clean & Green." These are stock funds, but the names have been translated from Wall Street jargon into normal people speak. Stash gets high marks from users for making investing easy and accessible, but pay attention to the fees. Stash charges $1 a month. That doesn't sound like a lot, but a user really needs to invest at least $250 or more for that level of fees to not eat up returns.